During the floods that hit the Russian Far East, most of the water crept up to the very walls of the enterprise that produces and assembles the Sukhoi Superjet 100 (SSJ-100). Yet the production of aircraft did not stop for even one day. How did factory workers literally keep the most ambitious Russian aircraft manufacturing project above water? For the past few months, all of Russia’s attention has been fixed on Komsomolsk-on-Amur, where the most difficult flood situation in the history of Khabarovsk Territorywas developing. Hundreds of homes were lost under water and inhabitants of the city literally swept food products from the shelves of shops, in the fear that goods would not arrive on time via the region’s flooded roads. The Kom Highway itself — the road leading to the Komsomolsk-on-Amur aviation plant (KnAAZ) named after cosmonaut Yuri Gagarin — was also flooded. 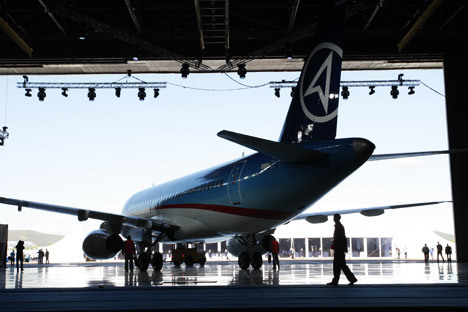 The KnAAZ aviation plant is the largest company in the city, as well as the site of assembly for Russia’slatest,most-promising aircraft — the Sukhoi Superjet. “How did people get to work? Well, exactly this way: Buses went with their wheels under the water. Driving was slow; two lanes were narrowed to one, [drivers] passed one at a time and, at the same time, fire hydrants pumped water out of the way,” employees of the plant say. When only the tops of the bushes could be seen sticking out of the water, buses had to find bypass routes. At the peak of flood, the water level of the Amur River at Komsomolsk reached 30 feet. The water crept close to the aircraft plant. If the river had risen another inch, the water would have penetrated all the lines of defense and poured into the factory buildings. Six hundred workers were sent to build dams, and an additional 400 military servants and special equipment were transferred from the Ministry of Defense of Novosibirsk. The first dam was built 655 feet away from the factory fence; the second dam was built directlyon the plant’s premises. The SSJ-100 is assembled in a huge hangar, where there are seven planes simultaneously in various stages of assembly. Together they form a cycle, working on an assembly line: Each area has its own operation, and, after it is completed, the plane is moved to the next job location. In the first stage,the fuselage junction is compacted with the tail section, both in the vertical and horizontal surfaces (keel and steering control stabilizers on the tail of the aircraft); in the second and third stages, wings and the "abdominal" part of the aircraft are mounted, respectively; in the fourth stage, the cable network is put into place. After this, the blocks in the compartment avionics are assembled; the engines are installed. In the final stages, the aircraft must pass an independent inspection, after which the aircraft goes to a trial and performs a delivery and acceptance flight. "The plane stays at every operation location for 10 days, which means that the complete cycle of the assembly is just over two months,” says deputy head of the department of production, Vladislav Sidorenko. This year, the plant’s plan is to release 25 SSJ-100 aircraft; next year’s target is already 45. “In September, due to the flooding, we were slightly kicked off the track — but just a bit. We have already reached normal operation [again],” says Sidorenko. Test work on the Superjet was not discontinued during the flood, even when the water crept up quite close to the airfield. "We didn’t exactly have to walkon water, of course, but the real threat of flooding was there. On the days free of flights, the pilots went out to the dam too, because, if the electric sub-station had flooded, the plant would have been closed. But the flight schedule was not changed,” says the chief pilot of the SSJ test program, Sergei Korostiev. Superjet is not the only creation of KnAAZ: The plant is also the largest Russian manufacturer of Su-27, Su-30 and Su-35 combat aircraft and their modifications. In addition, promising future aviation complexes for the T-50 tactical fighting aircraft are produced here. "Dry jets" such as the SSJ-100 are assembled and repaired in a few shops, but the T-50 is keptunder an atmosphere of an extreme secrecy. In the shop, the T-50 is kept behind a plywood partition, so that it is not seen by passersby. Even taking pictures of it is not allowed. Currently, the water level continues to fall, but the situation remains complicated: The river’s flood plain is under water. From a bird's-eye view, the Amur River looks more like a sea than a river, out of which the tops of trees protrude. However, the main danger is already behind — for the city and for the Superjets.